Created by the Vinyl Siding Institute (VSI), this manual includes installation instructions based in part on ASTM D4756, Standard Practice for Installation of Rigid PVC Siding and Soffit. To get all the benefits of vinyl siding, ensure proper installation. Find useful tips in our manual including historic restoration, how to clean vinyl siding (including stain removal), and recycling leftover vinyl siding scrap. Vinyl siding is purposefully designed for ease of installation, with features that eliminate job site hassle. It's easy enough for one installer to handle alone. 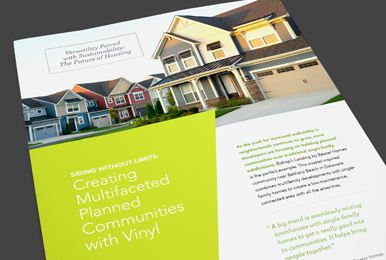 Before you install vinyl siding, learn your local building code requirements and how the codes relate to the instructions given in this manual and by your siding manufacturer. For more information, please see page two of the Vinyl Siding Installation Manual. Rely on a VSI Certified Installer to complete the job. Find a VSI Certified Installer today. If you're a professional with at least two years experience, you can become certified through VSI. Find a list of upcoming classes in your area. Review our online Vinyl Siding Installation Manual for a more dynamic experience with our tips and best practices. With vinyl siding, you can have it all without a premium price.